Indonesian Festival Nottingham (IndoFest) was first started in 2003 as a gathering event for Indonesian to play football together under the name “Pulkumpul”. On 2006, it was renamed as Indonesian Festival with addition of bazaar and performances. 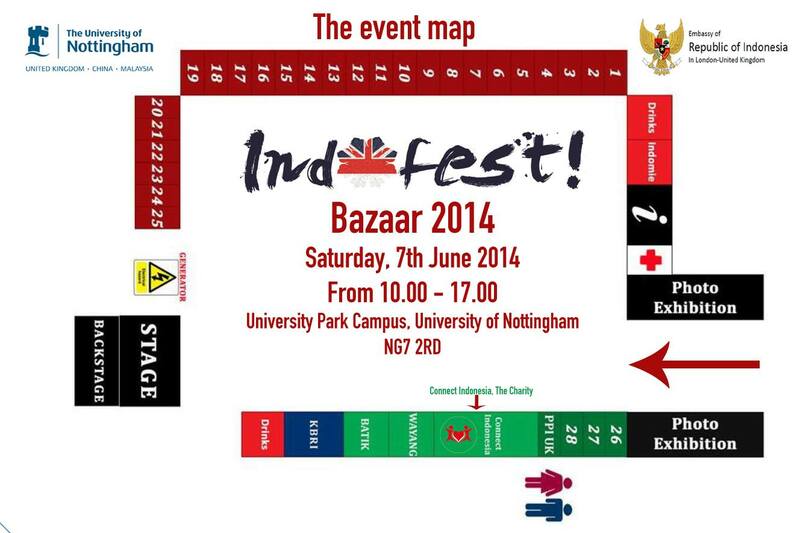 Since then, it has been the largest Indonesian Cultural event in United Kingdom. This year, IndoFest will have 3 main areas – Arts, Bazaar and Sports. For Arts, we would be bringing you Indonesian Culture through photo exhibition, Batik and Wayang Workshop, a number of Indonesian traditional folks games and not to forget, a line of great Indonesian performances on stage! Meanwhile, you can enjoy yourself with more than a hundred kinds of Indonesian foods prepared by the Indonesian natives at our Bazaar area (please refer to the picture below for the Bazaar area layout), from the sweetest to the spiciest. Nevertheless, Indonesians from all over UK will come over to Nottingham to compete with each other through various sports in BhinneCup. The event details can be seen here. On behalf of Indonesian Festival 2014 Organising Committee, I hope you would enjoy Indofest as much as we do!